Clarion Books (Houghton Mifflin Harcourt), 2009. 32 pages. I should have reviewed this book in the summer, when I first read it, and when I meant to review it. And that’s simply a reflection of how behind I am on getting reviews written. This book is a positively wonderful expression of a summer storm. The illustrations and the text combine with the onomatopoetic expressions written in the pictures (Who’s responsible for that? The author or the illustrator or both together?) to transport you into a summer storm, complete with thunder and lightning and hail. We see the wind pick up. It catches the clothes on the line. The dog catches Dad’s underwear! The sky darkens ominously. I love the way Carol Thompson captures the way the colors of the day dramatically change as the storm approaches and leaves. Together, they catch the sounds of the storm, the drama and the emotions of the storm. At the end, they discover a gift from the storm, a little kitten whose purr is like the voice of the storm. This is truly a beautiful book. Okay, it’s a little more appropriate for late summer than for early winter, but the story is nice any time of year. A wonderful cozy adventure of waiting out a thunderstorm in a nice safe shelter. 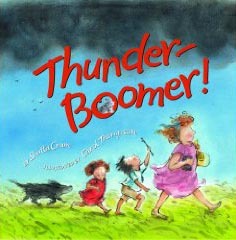 This entry was posted on Friday, November 27th, 2009 at 8:10 pm and is filed under Contemporary, Picture Book Review, Starred Review. You can follow any responses to this entry through the RSS 2.0 feed. You can leave a response, or trackback from your own site.